Dee Evetts. 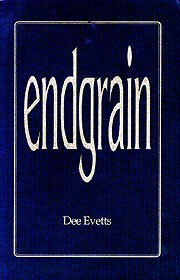 Endgrain: Haiku/Senryu 1986-1997 Red Moon Press (Winchester, VA) © 1998. Perfectbound, (5.5" X 8.5") 52 pages. In his introducation, Dee Evetts states that he views haiku as fundamentally "a literary genre. For all its brevity, it must ultimately be assessed by the same standards as all other literature. That is, by its aptness, wit, accuracy, felicity of language, and by its lack of sentimentality and moralizing." This collection shows that he is a modern master of the genre in English. Born in England in 1943, Dee Evetts has lived in New York City since 1990, marrying artist Alyson Pou in 1992. He is a professional carpenter and has written travel articles for the Times of London and for the BBC. He is also author of a Thai language course for Voluntary Service Overseas (British Peace Corps). Evetts began writing haiku in 1964 in conjunction with his studies of Zen Buddhism, and his own work was first published in 1970 in Haiku Magazine, edited by William J. Higginson. He has served a key role in the development of community among writers of English-language haiku. An active member of the Haiku Society of America since 1987, he has served as vice-president, as a judge for various competitions and as secretary in 1997. 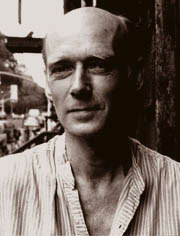 He was a co-founder of the British Haiku Society in 1990 and started the Spring Street Haiku Group in New York in 1991. He served as editor of "The Cutting Edge," a column for the Haiku Canada Newsletter. In 1994 he organized and curated the "Haiku on 42nd Street" project, with funding from the City of New York, in which haiku by 26 local poets was displayed for six months on the marquees of vacant movie theaters, during the redevelopment of 42nd Street at Times Square. In his essay "The Significance of Trivial Things" originally published in the Japanese edition of Newsweek (February 3, 1989) and reprinted in Modern Haiku 21.2 (Summer, 1990), Evetts examines the parallels between the haiku/senryu moment and James Joyce's concept of epiphanies in literature. As evidenced in his own haiku and those selected for publication as editor of various Spring Street Group anthologies, Evetts promotes a concept of haiku as epiphany. He writes haiku of key moments-turning points-in his own and others' lives. His first collection of haiku and longer poems, A Small Ceremony, was published in 1988. Throughout this new collection, Dee Evetts skillfully demonstrates the wide range of poetic achievement possible in haiku. From the unforgettable comic moment when his waitress flourishes her washrag to that moment of insight into existence as his woodshavings roll along the veranda, the poet presents the reader with a panorama of haiku happenings that both delight and spark awareness. With endgrain, Mr. Evetts enters haiku's front ranks. Tenderness and wit run through endgrain; reading it we know the poet's days and hours, and our own.